The Dharma Parlour is an Area of the Festival dedicated to exploring the teachings of the Buddha and how it applies to us in the modern world. It has a full programme of activities over the weekend including a series of talks, study and workshops. You can see the whole Dharma Parlour programme as well as an outline for the Meditation Space on the main Buddhafield Website. From the Triratna Buddhist Order we have Lokabandhu, Shgantigarbha, Kulamitra, Maitridevi and Dhivan giving talks on topics from 10 Ways to Misunderstand Buddhism to The Buddha Broke my Heart ; Theravadin monk the Venerable Amaranatho will be talking on the topic of The Listening heart and later leading a panel discussion on The Impact of Mindfulness ; Dr. Tashi Zangmo and Marie Thesbjerg will be giving their own series of talks around themes arriving from their work with the Buthanese Nuns Foundation. TBO members Dhivan and Mahabodhi will be leading daily study over the weekend where you can investigate two themes from the Buddha’s teaching, love as a means to Enlightenment and the Buddhist perspective on feelings and emotions. The Dharma Parlour has it’s own workshop programme, and there’s something for everyone, from meditation for parents with Upayavira, to an introduction to Buddhism with Advayasiddhi, and an exploration of traditional “elements” meditations with Caroline Brazier. 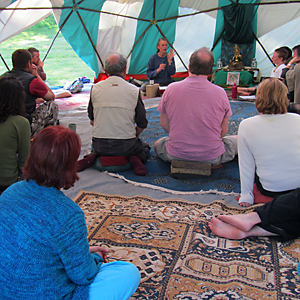 Thanks to Free Buddhist Audio for hosting the talks recorded at last year’s Buddhafield Festival. Dharma Doorways and Deadends: not all that glitters is gold. Lokabandhu explores the fascinating Buddhist notion of “near enemies”, those seductive but misleading lookalikes to authentic spiritual qualities. Living in an Illusion … Dying to Escape: Khemasuri talks about everyday experience as virtual reality, focusing on death to turn towards the truth, and “thin moments”. Embracing Love: Vajrasara explores the joys and challenges of love, empathy, passion and compassion on the spiritual journey. Doors to Freedom: the Buddha’s Psychology of Liberation with Dhivan, author of This Being, That Becomes: the Buddha’s Teaching on Conditionality , talks about some of the historical Buddha’s ideas on how conscious awareness can influence unconscious patterns that keep us imprisoned in a fixed sense of self. This entry was posted in Dharma, Festival, News Headlines and tagged Dharma study, Free Buddhist Audio, talks by Satyadarshin. Bookmark the permalink.